Will 2015 really be a new year for you or just a repeated old 2014, 2013...? If you want to discover a new version of yourself in the New Year, let's start by doing something new and different. 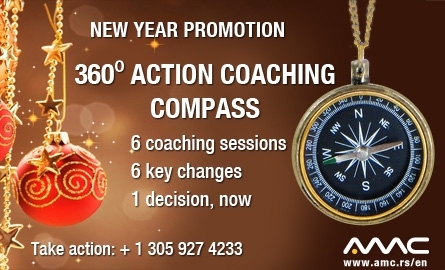 ACTION COACHING COMPASS will as a real compass, bring clarity into your life by, first, defining where you are at the moment, then, what are the possible directions to go to and which direction to choose in order to reach your wanted destination. In whichever area of your life you would like to have different results – finances, health, relationship, carrier, friendship, personal growth – you can have it in all 360⁰! With our professional coach, Gordana Berger, you will achieve more than you ever believed possible on this coaching journey. If you are ready to find your compass and create new action now, lets start! Boundary between joy and sorrow divide hours, minutes… I realized that the art of crossing side to side makes our life. The room is small and often difficult to traverse. For that you need a master. Thank you, Gordana, for your courage, the size of a grand master and skill to help me to always be on the right side.